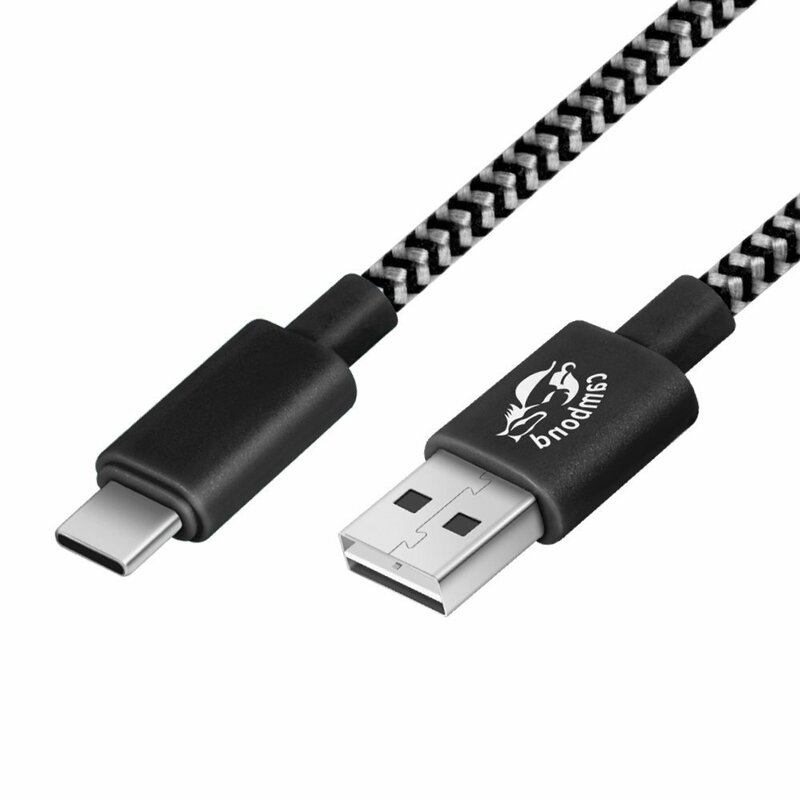 Home › Electronics › Usb C Cable 2.0 Cambond 6.6Ft Braided Double Sided Reversible Connector Type-..
Usb C Cable 2.0 Cambond 6.6Ft Braided Double Sided Reversible Connector Type-..
Reversible at both ends; Both USB Type A and Type C are reversible designs for you to insert the connector the right way, every time. You can just plug and go! Within Spec for CC Termination; 1.Voltage: 5V; 2. Voltage Drop < 0.55V; 3. Pullup Resistor: 56k ohm; 4. Support fast charge with max 2.4 amp charging capabilities from the 2.4A output USB port on wall chargers or car chargers. Stylish Design; High quality stylish nylon fiber jacket makes it stand out from bunch of cables and provides higher durability and increased flexibility with tangle-free. Latest style USB Type C to Type A Male can connect the Galaxy Note 7, new Apple MacBook (12 inch, 2015), Nokia N1 Tablet, the Google ChromeBook Pixel (2015), Asus ZenFone 3, ZenFone 3 Deluxe, ZenFone 3 Ultra, HP Chromebook 13, Nextbit Robin, New Ulefone, OnePlus 2/3, Asus Zen AiO, LG G5, Google Nexus 5X, Nexus 6P, Lumia 950/50XL, Lenovo ZUK Z1, HP Pavilion x2, New Apple TV 4 with App Development, ASUS Zenpad S 8.0 and Other Devices with Type C USB for transferring data or charging. At Cambond, we believe in our products. That's why we back them all with an 12-month warranty and provide friendly, easy-to-reach support. Color: 6.6ft Grey Double-Sided Reversible Connectors: Both USB Type A and Type C are reversible designs for you to insert theconnector the right way, every time. You can just plug and go! Within Spec for CC Termination: 1.Voltage: 5V; 2. Voltage Drop < 0.55V; 3. Pullup Resistor: 56k ohm; 4.Support fast charge with max 2.4 amp charging capabilities from the 2.4Aoutput USB port on wall chargers or car chargers. Stylish High Quality Nylon Fiber: High quality nylon fiber jacket provides higher durability and increasedflexibility. The braided covering makes it stand out from bunch of cables andalso look much more attractive, especially when not in use. Tangle Free: Tangle free cord design eliminates bunching, tangles, and knots. A velcrocable tie is included and allows you to keep your cables neat and tidy. What You Get: USB-C to USB 2.0 Cable (6.6ft), After Sale Warranty Card, our Cambond fan-favorite 12-month warranty and friendly, easy-to-reach customer service. Compatible Devices: Compatible Devices: Latest style USB Type C to Type A Male can connect theGalaxy Note 7, new Apple MacBook (12 inch, 2015), Nokia N1 Tablet, the GoogleChromeBook Pixel (2015), Asus ZenFone 3, ZenFone 3 Deluxe, ZenFone 3 Ultra, HPChromebook 13, Nextbit Robin, New Ulefone, OnePlus 2/3, Asus Zen AiO, LG G5,Google Nexus 5X, Nexus 6P, Lumia 950/50XL, Lenovo ZUK Z1, HP Pavilion x2, NewApple TV 4 with App Development, ASUS Zenpad S 8.0 and Other Devices with TypeC USB for transferring data or charging.